This year is the first year in a very long time that all the family will be home for Thanksgiving. My grandchildren are coming over the river and through the woods to be with us this year. I was thinking about our usual Thanksgiving celebration and how to incorporate a 3-year-old and a 5-year-old. 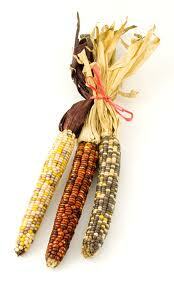 You see, we finish the meal by passing out 5 kernels of Indian corn to each person. Then we go around the table and for each kernel of corn we put in the cup we say something that we are thankful for in this year. Since the last years have been celebrated only with adults, this time consuming process has been easily tolerated, but I am concerned with the wiggle-worms this year. While looking up scriptures about giving thanks I came upon an old one memorized in my youth. It contained the answer to my concern. One year, at Thanksgiving I passed out small cards to everyone asking family members to write in their special thanks to God. Then at Christmas passed them out to be shared or for the person to remember their Thanksgiving offering to God. I especially have my own personal Thanks to God this year which I have continued to praise God for!